July 2014 – Page 2 – Welcome to Wyandotte Daily! Recently, the American Culinary Federation held its annual convention in Kansas City, Mo. The chefs are the best of the best, more than 1,200 of them from all over the world came to attend the event. This is the first time that they came to Kansas City, Mo. The Greater Kansas City Chefs Association laid out the red carpet for them. American Culinary Federation is the professional organization for chefs known worldwide. American Culinary Federation chefs have to go through countless hours of training. At the national convention, they attend seminars. There many types of certifications within the organization. While at the convention, the chefs also had time to visit local restaurants. One in particular is Kevin Strickland, a chef from Memphis, Tenn., who was really surprised. On July 24, the first night of the convention, there was a barbecue competition where local barbecue teams had a chance to compete. After the competition, the chefs had a chance to taste the barbecue. Many of them had never tried Kansas City barbecue before. 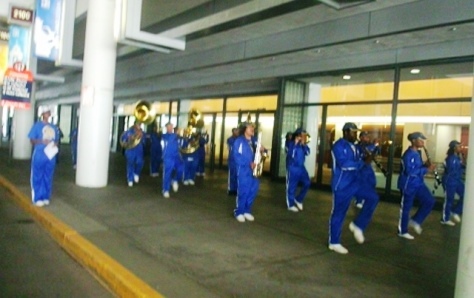 Before the trade show, the Schlagle High School marching band paraded them to their show. The president of the American Culinary Federation, Tom Macrina, was really impressed. “I used to play the clarinet when I was young. They did a fantastic job. I really enjoyed it,” he said. Other chefs were equally impressed. The ACF has a program called Chef ‘n Child, where members go out to schools to teach the children how eat healthy. This is their way of combating the serious social problem of obesity, said chef Mark Webster, president of the Greater Kansas City Chefs Association. 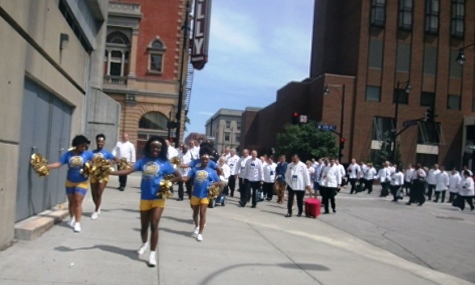 Also at the convention, culinary students from the culinary program at the Kansas City Kansas Community College volunteered, giving Kansas City, Kan., national and international attention. At the final awards banquet held Monday evening, Johnson County Community College culinary students received the top student award. This is one of the group’s most prestigious awards. Culinary schools from all over the world competed for this honor. Mark Webster, president of the Greater Kansas City Chefs Association, said, “Kansas City is getting to be a culinary Mecca.” This is mainly due to the many culinary schools in the Greater Kansas City area. Many of those who attended said they were planning to bring their families to Kansas City after the convention is over. “I plan to be back. The food is great and the people are fantastic. 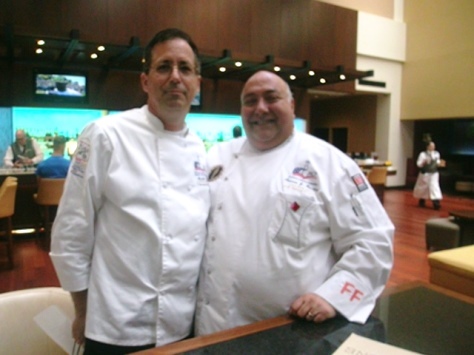 I had a great time,” said chef Tom Macrina, president of the American Culinary Federation. More than 160 high school students and adult advisers from 15 counties plan to attend the 13th annual Kansas Youth Leadership Summit Aug. 3-5 at Rock Springs 4-H Center, Junction City, Kan. Some of the students are from Wyandotte County, according to a KYLS spokesman. KYLS is sponsored by the Kansas Department of Transportation and focuses on reducing underage alcohol and drug use, and encouraging safety belt use and safe driving behavior among Kansas youth. Through interactive sessions and skill-building activities, KYLS participants will explore new ways to deal with critical issues facing teens and communities today, including alcohol and drug availability, perception of harm, community social norms, family attitudes, binge drinking, marijuana use, crash dynamics and more. Bill Cordes, nationally-known motivational speaker and author who presents to more than 70,000 students, teachers and businesses annually, will lead the summit. KYLS participants will also hear from a young Topeka adult who suffered a traumatic brain injury as a result of underage drinking. For more information about KYLS, visit www.kansasfamily.com. The Unified Government Commission is scheduled to vote on its budget tonight. The budget vote is on the agenda for the 7 p.m. July 31 meeting at City Hall, Commission Chambers, 701 N. 7th St., Kansas City, Kan.
A $295.8 million budget with a net zero tax increase in Kansas City, Kan., was proposed by the UG administrator. The UG administrator’s proposed budget would increase the mill levy by 2 mills on the county side and decrease it by 2 mills on the city side. The commission also discussed raising the proposed mill levy on the city side to its current rate. The budget includes a 7 percent increase in water pollution fee charges, and an unchanged PILOT fee on BPU bills of 11.9 percent. All budget items are subject to change before the final vote. An earlier budget workshop before the July 31 meeting was canceled. Also scheduled is a closed session to discuss litigation at 6 p.m. July 31 in the ninth floor conference room. Also on the July 31 agenda for the 7 p.m. meeting are several planning and zoning items. –	A change of zone for McDonald’s at 4215 Rainbow Blvd., considering a previous stipulation about constant operation hours, 24 hours a day. –	A change of zone from planned general business, single family, planned apartment and planned commercial districts to general industrial district for a general equipment rental operation for homeowners and contractors at 2708 and 2710 Merriam Lane and 3000 S. 27th St.
–	Preliminary plan review for a public safety facility at 2100R Metropolitan Ave.
–	Master plan amendment from business park to employment at 2708 and 2710 Merriam Lane and 3000 S. 27th St.
–	Ordinance rezoning property at 101 S. 76th St. from single-family district to agriculture district\. An agenda is online at www.wycokck.org.